We will only load 40sqm in a 7×5 trailer as this will weigh approx 750kg. If you have a 6×4 trailer your are more that welcome to hand load your trailer. For larger orders of over 40sqm a trailer with brakes is required. If you do not have trailer brakes and your load is over 40sqm we reserve the right not to load you on our premises due to health and safety and Qld Transport regulations. All orders must be paid for 48 hours prior to pick up. This can be done by providing credit card details to our office or requesting a tax invoice to be emailed with our banking details. If paying by direct transfer please allow the payment to be cleared 48 hours prior to delivery. If for any reason you need to cancel your turf order 48 hours notice is required to obtain a full refund. If you do not give us adequate notice and your order has already been cut, you must pick it up at the agreed time and no refund will be given. An allocated time will be given to you when you make the booking. Please wait until your allocated time and proceed down the driveway to the loading bay. This is to allow other vehicles to exit the property with their loads safely. If you are late please notify the office as soon as possible. If you are before or after the allocated time and you have not notified the office you will have to hand load your order into your Ute or trailer. It is due to health and safety reasons our staff will not be able to help you hand load your order. We will load you Ute or trailer using our forklift. If the forklift will not fit due to wheel tubs on your Ute, you must hand load to avoid damage to your vehicle. Please allow a minimum of 1250mm x 1250mm as these are the sizes of our pallets. 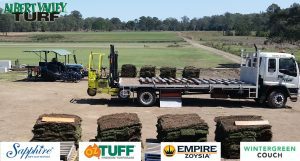 No pallets are allowed to be removed from Albert Valley Turf, all turf is picked up with our forklift and loaded into your Ute or trailer pallet free. We do not accept any liability to damage caused to you or your vehicle on our premises. 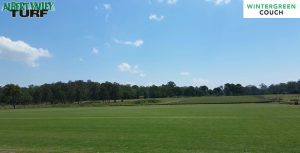 The customer is solely responsible for all turf when taken off our property. Rain weather events do happen at our farm which halt any harvesting if it is too wet. If this does occur and we cannot harvest, staff will notify you on the morning of your pick up and we will reschedule to the next dry day or a day that best suits you. If this is not suitable a full refund is given.